Looking back at 2014, it was quite a year for the veteran community. IAVA spent a great deal of the year focusing on the Campaign to Combat Suicide and the Clay Hunt Suicide Prevention for America’s Veterans Act. Beyond that, there was major focus on VA patient wait times after allegations of mismanagement at the Phoenix VA came to light, a new VA Secretary was confirmed, and the mid-term elections resulted in 14 new veterans in Congress (11 in the House and 3 in the Senate). Throughout all of this, the Veterans Benefits Administration continued its work on reducing the VA backlog of disability compensation claims. Former VA Secretary Eric Shinseki pledged to end the VA backlog of disability compensation claims by the end of Fiscal Year 2015. With 2015 now upon us, that deadline is fast approaching and the question remains as to whether that goal can be met. But before we consider that question, first a quick look into the history of this issue. 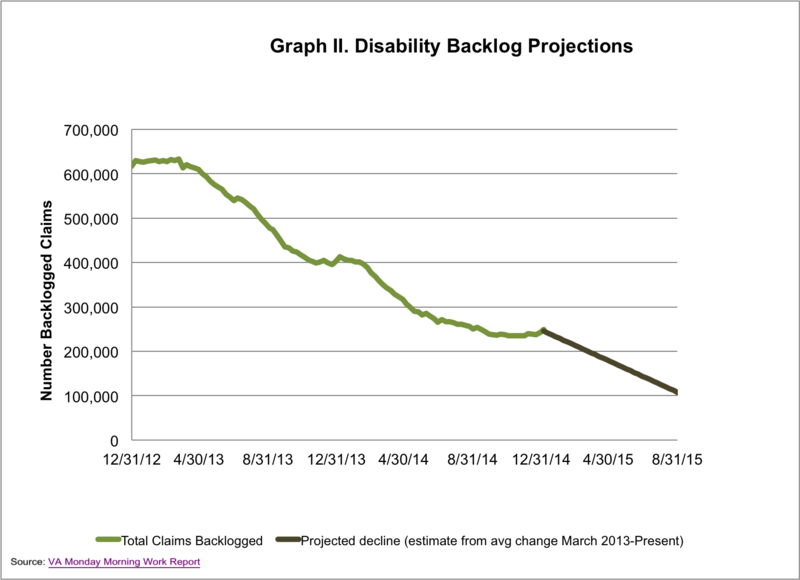 In January 2013, the Department of Veterans Affairs released its plan to eliminate the disability compensation backlog by the end of FY 2015. Backlogged claims are those that have been pending at the VA for over 125 days, and in March 2013 the number had reached an all-time high of over 600,000 claims. That translated to over 600,000 veterans who had been waiting over 125 days, and some multiple years, for a decision on their VA disability claim. This is particularly important to Vietnam and Gulf War veterans, who make up the vast majority of veterans submitting claims. The VA plan had a number of components based around three main initiatives: people, process and technology. Key among these initiatives was the implementation of an automated system of claims processing. Other initiatives included the implementation of the fully developed claims process, mandatory overtime for VA employees processing these claims to help in the fight to decrease the numbers, and a concerted effort to close out all claims pending for over a year or more. With this new focus and goal, the VA closed out 2013 with a 34% decrease in the backlog (over 400,000 claims still remained). At the same time, the number of pending claims decreased by 24% and the number of appealed claims increased 5.7% (see Table I). 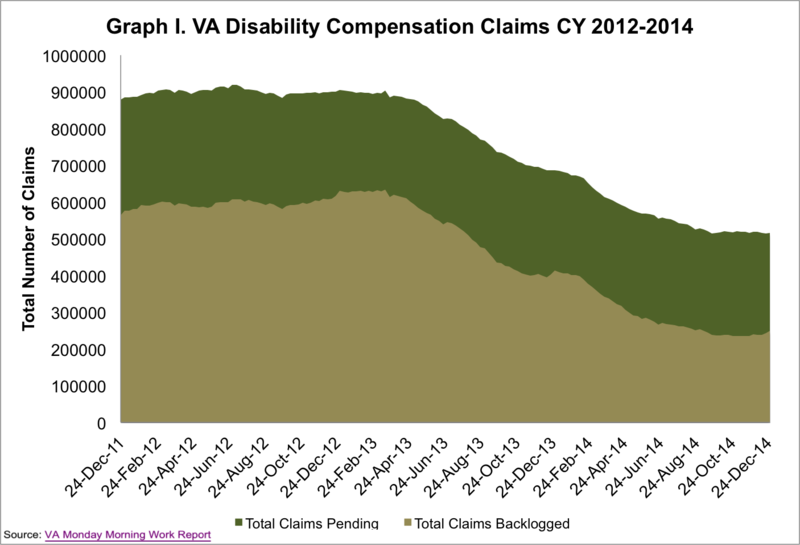 At the close of CY2014, nearly 250,000 claims remain in the VA backlog (a 40% reduction in the backlog for CY 2014). The number of pending claims decreased to 515K (a reduction of 25% for the year) and the average time to complete a claim also significantly decreased. Finally, the number of appealed claims increased by 8%, and totals over 288,000, surpassing the number of backlogged claims. This is also the highest number of pending appeals to date. As we consider these numbers, dig further into overall rates of progress since the start of CY 2013 and anticipate the pending goal of zero backlog by the end of FY 2015 the simple question appears to be whether “it” can be done. But more importantly isn’t considering whether “it” can be done, but whether the VA has built a system that allows “it” to be done accurately. 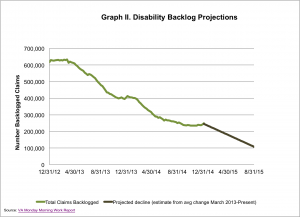 The VA is making solid progress in decreasing the backlog numbers (see Graph I). No one can contest that. By IAVA’s projections, based on the rates of adjudication over the last two years, it likely won’t hit zero by the end of 2015, but it’ll get close (see Graph II). However, it’s important that we’re not just focusing on the numbers, but also on the accuracy by which these claims are being completed. This was a major focus in IAVA’s 2014 Red Tape Report. In that report, our analysis and recommendations focused on creating a system of adjudication whereby accuracy of claims adjudication is just as important as adjudicating in a timely manner. This accuracy piece continues to be a concern, in part based on findings from various regional office inspections by the VA Office of the Inspector General (VAOIG) and in part due to the increasing number of appealed claims. For example, a recent (November 2014) evaluation of the West Virginia Regional Office in Huntington found the VARO staff did not accurately process 27 of 68 disability claims reviewed by VAOIG. There are other regional offices reviewed in the last year where this number was unacceptably high. So it’s not just about ending the backlog, but more importantly, it’s about ending it in a way that the veteran community can be confident in the process. 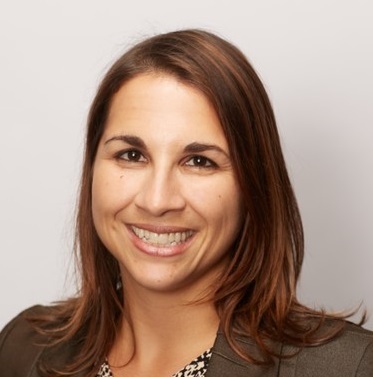 By continued focus on improving training (including proactive identification of problem areas) and striking a balance between incentivizing numbers and accuracy (rather than a focus on the numbers), some of these issues can be better addressed. And as accuracy is improved and trust in the process is restored, this is one way that we can address the continually growing number of appeals. Each year the number of VA disability claims continues to grow. Vietnam and Gulf War era veterans make up the vast majority of these claims. It’s very likely that the number of claims will continue to rise, particularly as research uncovers more illnesses and injuries associated with these wars. The goal to end the VA disability backlog is an important one; but even more important is a pledge to ensure that it never returns. This will require a long-term commitment by the VA to evaluation of current processes, modernization to support future needs and oversight to ensure accountability. In short, it requires a comprehensive plan beyond 2015.